Sound Test: Pause during a game, then press A, B, C, D, A. Fight Ryo Sakazaki: Clear the game without losing a single round. Next to Wolfgang Krauser, Ryo from Art of Fighting awaits you. 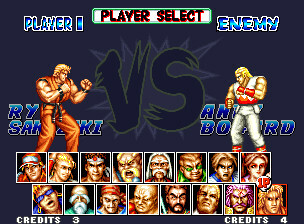 Play Ryo Sakazaki(Neo Geo AES): Beat Ryo. When the game restarts after the credits, wait for the demo to start and 'Fight!' to appear: Quickly, press ↑ ← ↓ → ↑ A, ↑ → ↓ ← ↑ C. If the command was made correctly, you'll hear Ryo shouting 'Ora Ora!'. Now, a Versus Mode is available and Ryo can be selected!